To change the thumbnails pages file name go to the Options step, the Thumbnails pages tab and click the ... button in the Page file name template section. 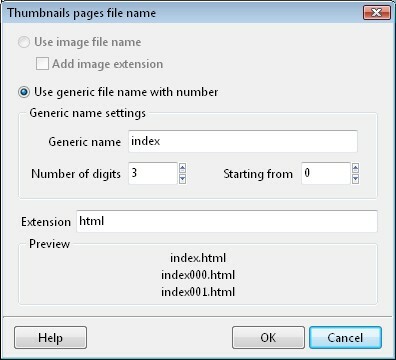 It opens the file name template editor window. The file name for thumbnails pages is generated using the Generic name of your choice plus a number. You can specify how many digits this number will have in the Number of digits field and what will be the first value of this number in the Starting from field. Also you can specify the extension for your thumbnails pages file name in the Extension edit field. The first generated thumbnails page will have only the generic name part and the extension. The number is not added to the first thumbnails page only.